The province of Prince Edward Island, Canada has a landscape that resembles one large playground, with sandboxes, water games and pedal paths. Here everyone in the family can have fun together. Enjoy the live theatre that appeals to all ages, adventure parks with both the thrill of the waterslides and quiet green picnic places or workshops in traditional arts and crafts. Or gather up the gang for an evening of musical entertainment at one of our community ceilidhs. Explore Prince Edward Island: So Much To See - So Much To Do. Each Region is the sub-divided into Accommodations, Attractions, Arts-History-Culture, Food & Beverage, Outdoor Fun, Services, Shopping and Touring. 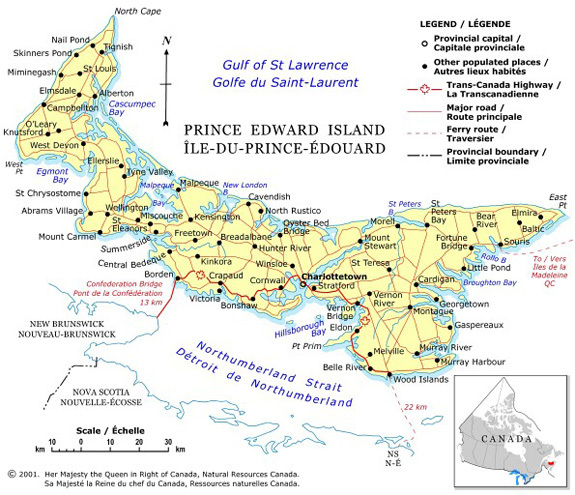 You will see listings for Bed and Breakfasts, Hotels, Motels, Cottages, Boat Tours, Adventure Tours, Guided Tours, Craft and Gift Shops, Historic Sites, Car Rentals, Restaurants, Lobster Suppers and much more to help you plan your trip to our pretty and peaceful province of Prince Edward Island. We are constantly adding to our site, so come back often.